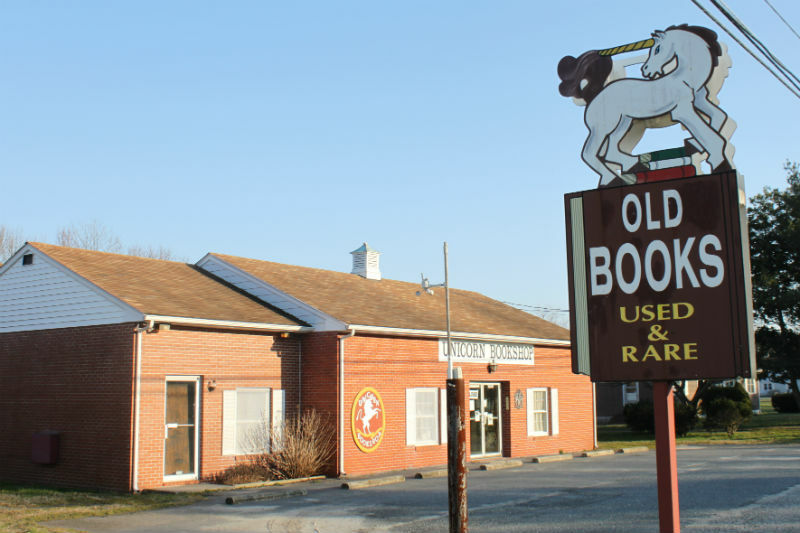 For 30 years, Unicorn Books has been located on the west bound side of Route 50 between Easton and Cambridge. Who would guess that there are over 30,000 used and rare books inside this humble one-story building? The brick building fades into the background of the Eastern Shore landscape, and would probably go unnoticed by drivers and passengers whizzing down the highway were it not for the 1960s-looking sign topped with a white unicorn advertising OLD BOOKS. Every beach-goer knows this sign. Small as it is, it stands out. My children remember it as a way marker on our beach-bound drives. That unicorn sign came right before Cambridge, and Cambridge marked our one stop along the way (at the Wawa). If ever there was a place worth stopping, it’s Unicorn books. There’s something for everybody there. I go there for books on Maryland history – particularly the Eastern Shore. Their Maryland history section is the largest I’ve ever seen in a used bookstore. They’ve got books on travel, agriculture, writing, world history, Civil War, gardening, hunting, fishing, genealogy, poetry, photography, cookbooks, birds, cats, coins, and books on trains and railroads. Every hobby and craft is represented by some type of book. And don’t get me started on the paperbacks. Geez. Unicorn Books has a nice fiction section. There are many hardcovers and classics, but just past the front section is a hallway lined floor to ceiling with paperbacks. For the voracious consumer of fiction, it’s an delicious little hallway. There must be thousands of paperbacks – all $1.00. Why stop at the drug store and pay $7 for something to read on the beach when you can stop at Unicorn and get seven books for $7? In addition to the tens of thousands of used books, Unicorn Books owner James Dawson has a large collection of old maps and some reproductions that are for sale. I love maps – love maps – love maps. And they’re everywhere. Even in the bathroom. There’s even a separate map room on the second floor in an annex. Antique clocks are also scattered around the store, but are not for sale. They add a certain flare to the Unicorn Books experience. The store is typically silent – like a library – except for the ticking of the old clocks. Mr. Dawson keeps the nicer books, book sets, first editions and collector books in a separate section he refers to as The Better Book Room. For the book lover, this is almost like a museum. A double treat is to get Mr. Dawson to come into the Better Book Room and talk about some of the items he showcases. Almost all of the items in the store are for sale – except the clocks. Charlie Paparella of WBOC-TV covered Unicorn Books in 2010. This video clip shows the inside of the store, the owner, James Dawson and offers a closer at what the store offers the community. For those traveling to the beach, Unicorn Books is a place worth stopping. Even if you’re not driving to the beach and your like my husband – just driving – pull in and say hello. Take a look. Pick up a book or two. It’s time well spent. I discovered Unicorn Books in the late 1980’s. While I live in Delaware, I try to make at least one trip every year to visit this bookstore.